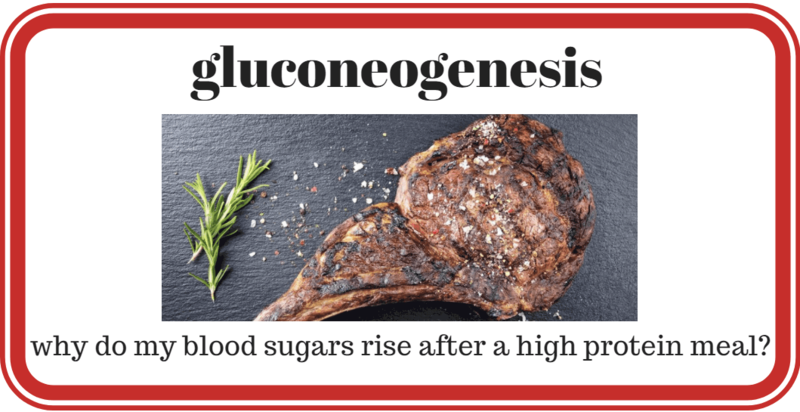 There is a lot of controversy and confusion over gluconeogenesis and the impact of protein on blood sugar and ketosis. If you are managing diabetes, should you avoid protein because it can convert to glucose and “kick you out of ketosis”? If you’ve dropped the carbs and protein to manage your blood sugars, should you eat “fat to satiety” or continue to add more fats until you achieve “optimal ketosis” (i.e. blood ketone levels between 1.5 and 3.0mmol/L)? Then, if adding fat doesn’t get you into the “optimal ketosis zone”, do you need exogenous ketones to get your ketones up so you can start to lose weight? And what exactly is a “well formulated ketogenic diet” anyway? what they can do to optimise the metabolic health. You’re probably aware that protein can be converted to glucose via a process in the body called gluconeogenesis. Gluconeogenesis is the process of converting another substrate (e.g. protein or fat) to glucose. All but two amino acids (i.e. the building blocks of protein) can be converted to glucose. Five others can be converted to either glucose or ketones depending on the body’s requirements at the time. Thirteen amino acids can be converted to glucose. Once your body has used the protein it needs to build and repair muscle and make neurotransmitters, etc. any “excess protein” can be used to refill the small protein stores in the bloodstream and replenish glycogen stores in the liver via gluconeogenesis. The fact that protein can be converted to glucose is of particular interest to people with diabetes who go to great lengths to keep their blood sugar under control. Someone on a very low carbohydrate diet may end up relying more on protein for glucose via gluconeogenesis compared to someone who can get the glucose they need directly from carbohydrates. Obtaining glucose from protein via gluconeogenesis rather than carbs is that it is a slow process and easier to control with measured doses of insulin compared to simple carbs which will cause more abrupt blood sugar rollercoaster. How much insulin does protein require? The food insulin index data   is an untapped treasure trove of data that can help us understand the impact of foods on our metabolism. The food insulin index testing measured the glucose and insulin response to various foods in healthy people (i.e. non-diabetic young university students). To calculate the glucose score or the insulin index pure glucose gets a score of 100% while everything else gets a score between zero and 100% based on the comparative glucose or insulin area under the curve response. So we are comparing the glucose and insulin response to various foods to eating pure glucose. As shown in the chart below, the blood glucose response of healthy people is proportional to their carbohydrate intake. Meat and fish and high-fat foods (butter, cream, oil) tend to have a negligible impact on glucose. The story is not so simple when it comes to our insulin response to food. As shown in the chart below, the carbohydrate content of our food only partially predicts our short-term insulin response to food. Low fat, low carb, high protein foods elicit a significant insulin response. As you can see in the chart below, once we account for protein we get a better prediction of our insulin response to food. It seems we require about half as much insulin for protein as we do for carbohydrate on a gram for gram basis to metabolise protein and use it to repair our muscles and organs. But does this mean we should avoid or minimise protein for optimal diabetes management or weight loss? Does protein actually turn to chocolate cake? What happens to insulin and blood sugar when we increase protein? While protein does generate an insulin response, increasing the protein content of our food typically decreases our insulin response to food. Increasing protein generally forces out processed carbs from our diet and improves the amount of vitamins and minerals contained in our food. Similarly, increasing the protein content of your food will also decrease your glucose response to food. What happens when you eat a big protein meal? The food insulin index testing was done using 1000 kJ or 240 calories of each food (i.e. a substantial snack, not really a full meal). But what about if we ate a LOT of protein? Wouldn’t we get a blood sugar response then? So, if protein can turn to glucose, why don’t we see massive glucose spike? What is going on? To properly understand how we process protein, it’s critical to understand the role of the hormones insulin and glucagon in controlling the release of glycogen release from our liver. These terms can be confusing. So let me spell it out. The liver stores glucose in the form of glycogen in the liver. Glucagon is the hormone that pushes glycogen out into the bloodstream as blood glucose. Insulin is the opposing hormone that keeps glycogen stored in our liver. When it comes to getting glucose out of the liver, glucagon is like the accelerator pedal while insulin is the brake. When our blood glucose is elevated, or we have external sources of glucose, the pancreas secretes insulin to shut off the release of glycogen from the liver until we have used up or stored the excess energy. Insulin helps to turn off the flow of glucose from our liver and store some of the excess glucose in the blood as glycogen and, to a much lesser extent, fat (via de novo lipogenesis). It also tells the body to start using glucose as its primary energy source to decrease it to normal levels. We can push the glucagon pedal to extract the glycogen stores in our liver by eating less carbohydrate (i.e. low carb or keto diets), eating less, or not eating at all (aka fasting)! High insulin levels effectively mean that we have enough fuel in our blood stream and we need to put down the fork. While fat typically doesn’t require significant amounts of insulin to metabolise, an excess of energy from any source will cause the body to ramp up insulin to shut off the release of stored energy from the liver and the fat stores. At the risk of getting a little bit geeky, let’s look at how our hormones respond to different types of meals. As shown in the chart below, when we eat a high carbohydrate meal insulin rises to stop the release of glycogen. Meanwhile, glucagon drops to stop stimulating the release of glycogen from the liver. When we have enough incoming glucose via our mouth, we don’t need any more glucose from the liver. When we eat a high protein meal, both glucagon and insulin rise to maintain steady blood glucose levels while promoting the storage and use of protein to repair our muscles and organs and make neurotransmitters, etc. (i.e. important stuff!). In someone with a healthy metabolism, we get a nice balance between the insulin (brake) and the glucagon (accelerator). Hence, we don’t get any glycogen released from the liver into the bloodstream to raise our blood sugar because the insulin from the protein is turning off the glucose from the liver. This is why metabolically healthy people see a flat line blood sugar response to protein. Things are different if you have diabetes. Insulin resistance means that between our fatty liver and insulin resistant adipose tissue, things don’t work as smoothly. While your blood sugar may rise or fall in response to protein, needs to rise a lot more while you metabolise the protein to build muscle and repair your organs. Unfortunately, people who are insulin resistant may struggle to build muscle effectively due to insulin resistance. Then the higher levels of insulin may drive them to store more fat in the process. Becoming insulin sensitive is important! The chart below shows the difference in the blood glucose and insulin response to protein in a group of people who are metabolically healthy (white lines) versus people who have type 2 diabetes (yellow lines). People with diabetes may see their glucose levels drop from a high level after a large protein meal and will have a much greater insulin response due to their insulin resistance. People with more advanced diabetes (i.e. beta cell burn out or Type 1 diabetes) may even see their blood sugar rise. Their ability to produce insulin to metabolise the protein and keep glycogen in storage cannot keep up with the demand. Drawing on the brake/accelerator analogy, it’s not necessarily protein turning into glucose in the blood stream via gluconeogenesis, but rather the glucagon kicking in and a sluggish insulin response that isn’t able to balance out the glucagon response to keep the glycogen locked away in the liver. Healthy people will be able to balance the opposing hormonal forces of the insulin (brake) and the glucagon (accelerator), but if we are insulin resistant and/or don’t have a properly functioning pancreas (brake), we won’t be able to produce as much insulin to balance the glucagon response. Someone who is insulin resistant has normally functioning accelerator pedal (glucagon stimulating glucose release in the blood) but a faulty brake (insulin). To unpack this further, let’s look at an example close to home. The picture below is of a family meal (i.e. steak, sauerkraut, beans and broccoli) that we had when my wife Monica (who has Type 1 Diabetes) was wearing a continuous glucose meter. The photo of the continuous glucose monitor below shows Monica’s blood sugar response after the meal which we had at about 5:30 pm. Her blood sugar rises in response to the veggies and then comes back down as the insulin kicks in. The process to bring her blood sugars back under control from a few carbs in the veggies takes about two hours. But over the next twelve hours, Monica’s blood sugar level drifts up as the insulin dose goes to work as she metabolises the protein. For all intents and purposes though it looks like the protein is turning to glucose in her blood! This is not a one off. We’ve seen this blood glucose response regularly. The advent of continuous glucose meters makes this more evident as you can watch blood sugars rise over a long period after a high protein meal. Many people with type 1 diabetes know they need to dose with adequate insulin for protein. Once you work out how to reduce simple carbs, working out how to dose for protein is the next frontier of good insulin management. It’s complicated and sometimes confusing. More insulin or less protein? Why are Monica’s blood sugars rising? Is it too much protein? I think the best way to explain the rise in blood sugars is that there is not enough insulin to keep the glycogen locked away in her liver and metabolise the protein to build muscle and repair her organs at the same time. Meanwhile, the glycogen pedal is pushed down as it normally would be in response to a protein which is driving the glucose up in her bloodstream. There is just not enough insulin in the gas tank (pancreas) to do everything that needs to be done. Personally, I think the correct answer is C.
While it’s probably not wise to go hog-wild with protein supplements and powders if you have diabetes, swinging to the other extreme to target minimal protein levels is a sure way to end up with a poor nutritional outcome. According to Simpson and Raubenheimer in Obesity: the protein leverage hypothesis (2005), people with diabetes may actually need to eat more protein to ensure that they have adequate amounts to build lean muscle mass given that higher levels of gluconeogenesis may cause more protein loss to glucose due to their insulin resistance. One source of protein loss is hepatic gluconeogenesis, whereby amino acids are used to produce glucose. This is inhibited by insulin, as is the breakdown of muscle proteins to release amino acids, and therefore occurs mainly during periods of fasting (or low carb). However, inhibition of gluconeogenesis and protein catabolism is impaired when insulin release is abnormal, insulin resistance occurs, or when circulating levels of free fatty acids in the blood are high. These are interdependent conditions that are associated with overweight and obesity, and are especially pronounced in type 2 diabetes (12,34). It might be predicted that the result of higher rates of hepatic gluconeogenesis will be an INCREASED requirement for protein in the diet. A lot of my early motivation in developing the Optimising Nutrition blog was to understand which foods provoked the least insulin response and how to more accurately calculate insulin dosing for people with diabetes to help Monica get off the blood glucose roller coaster. Like Ted Naiman, I thought if we reduced the insulin load from our food (including minimising protein) we would have a pretty good chance of losing a lot of weight (just like someone with uncontrolled type 1 diabetes). I no longer think we need to restrict or avoid protein to manage insulin resistance. However, there’s no need to go to the other extreme and binge on protein if you are injecting insulin. Worrying about getting too little or too much protein is largely irrelevant. We will get enough protein when we eat a nutritious diet. Left to its own devices, our appetite typically does a good job of seeking out adequate protein to suit our current needs. Meanwhile actively aiming to minimise protein will make it harder to maintain lean muscle mass which is critical to glucose disposal and insulin sensitivity. If you see your blood sugar levels rise due to protein, it is likely due to inability to produce enough insulin rather than too much protein. If you are injecting insulin you may need to dose with more insulin to allow you to utilise the protein in your diet to build and repair your body. One option to minimise the adverse effects of excess insulin is to focus on reducing the insulin load of our diet and eat only high-fat foods that have a low proportion of insulinogenic calories (i.e. ones towards the bottom left of this chart). If you are highly insulin resistant and obese, this will work like magic, at least for a little while. But this is only part of the story. Again, we can learn a lot about insulin from people with Type 1 diabetes who have to manually manage their insulin dose. The bolus insulin is the insulin for the food we eat. The basal insulin is a steady flow of insulin that is required throughout the day and night. Without the basal insulin, we would disintegrate into uncontrolled gluconeogenesis and ketoacidosis (e.g. uncontrolled type 1 diabetes). In a person eating a typical western diet around half the insulin given in a day is for the food and half is basal insulin. The chart below shows the daily insulin dose of a person with type 1 diabetes eating a standard diet. The white component is the basal, and the black is the bolus for their food. In someone following a low carb diet only around 30% of the insulin is for the food and 70% is basal insulin as shown below in my wife Monica’s daily insulin dose shown below. We can only reduce our insulin requirements marginally by changing our diet. We always need basal insulin. If we’re insulin resistant, we’ll need more. Like caffeine or alcohol, we become more sensitive to insulin when we are exposed to less of it. As we reduce the insulin load of our diet, our insulin sensitivity will improve. But not everyone who follows a low carb diet instantly turns into a super athlete. There has to be more to the story. In addition to modifying our diet, we can also improve our blood glucose control by maximizing our body’s ability to dispose of glucose without relying on insulin (i.e. non-insulin mediated glucose uptake). We enhance our insulin sensitivity and our ability to use glucose by building more lean muscle mass. I used to think that if we just dropped the insulin load of our diet down far enough, we would be able to lose weight, a bit like someone with uncontrolled type 1 diabetes. But now I understand that there will always be enough basal insulin in our system to store excess energy (regardless of the source) and stop our liver from releasing stored energy. While a diabetic can reduce their insulin requirements for food by eating food with lots of fat, they can actually end up insulin resistant and need more basal insulin if they drive over abundance of energy, regardless of whether it’s from protein, fat or carbs. While ketones can rise to quite high levels when fasting (which is great), I fear that some people are chasing high ketone levels with lots of dietary fat and the excess energy may lead to insulin resistance in the long term. The method recommended by Dr Bernstein (who has type 1 diabetes himself) is typically lower in carbs, adequate protein (depending on whether you are a growing child) and moderate in fat. Even at 83, Dr B feels it is important to maintain lean muscle mass through regular exercise to maximise his insulin sensitivity. Will too much protein “kick me out of ketosis”? While the ketogenic diet is becoming popular, I think most people who are interested in it do not necessarily require therapeutic ketosis, but rather are chasing weight loss or blood sugar control/diabetes management. If you are managing a condition that benefits from high levels of ketosis (e.g. epilepsy, dementia, cancer, traumatic brain injury, Alzheimer’s) then limiting protein may be necessary to ensure continuously elevated ketone levels and reduce insulin to avoid driving growth in tumour cells and cancer. Giving the burgeoning interest in the ketogenic dietary approach, I think it’s important to understand the difference between exogenous ketosis and endogenous ketosis. Endogenous ketosis occurs when a person eats less than the body needs to maintain energy homeostasis and we are forced to up the glycogen in our liver and then our body fat to make up the difference. Exogenous ketosis (or nutritional ketosis) occurs when we eat lots of dietary fat (or take exogenous ketones), and we see blood ketones (beta hydroxybutyrate) build up in the blood. We are burning dietary fat for fuel. Higher levels of ketones in the blood are an indication that you are eating more fat than you are burning. Having some level of blood ketones is an indication that your insulin is low, but whether your blood ketones are high or low should not be a major cause for concern as long as your blood glucose levels are also low. Unless we are doing a long term fast, we will all be somewhere on the spectrum between exogenous and endogenous ketosis. Keep in mind though that most of the beneficial things we attribute to “ketosis” and the “ketogenic diet” occurs when we are in endogenous ketosis (i.e. when fat is coming from our body, not our plate or coffee cup). As detailed in the popular article What are Optimal Ketone and Blood Sugar Levels in Ketosis? it seems that lower levels of total energy (i.e. towards the left of this the chart below) is a better place to be, particularly if we are chasing weight loss or diabetes management. Our blood ketones may not be as high when we are in endogenous ketosis, but that’s OK because most of the good stuff happens in a low energy state. Stable ketone production all day Sharp rise of ketones for a short duration. Need to keep adding fat or exogenous ketones to maintain elevated ketones. Body fat and liver glycogen used for fuel Liver glycogen refilled and excess energy in the bloodstream stored as fat. Gluconeogenesis is the creation of new glucose (generally from protein). Protein requires about half as much insulin as carbohydrate to metabolise. Increasing protein intake will generally improve our blood glucose and insulin levels. Protein forces out processed carbohydrates, increasing the nutritional quality of our diet and helps us to build muscle which in turn burns glucose more efficiently. In a metabolically healthy person glucagon balances the insulin response to protein, so we see a flat line blood sugar response to even a large protein meal. If you cannot produce enough insulin, you may see glucose rise as your body tries to metabolise the protein and keep the energy stored in the liver at the same time. The insulin for the food we eat (bolus) represents less than half of our daily insulin demand. We can improve our basal insulin sensitivity by building lean muscle mass and improving mitochondrial function via a nutrient dense diet. If we are aiming for weight loss and health, then low blood sugars and low ketones will be more desirable rather than chasing high ketone levels via exogenous ketosis. Thank you very much. You just solved my biggest puzzle. Great article Marty. I think this statement from the article is not quite right. “Increased Blood Amino Acids Stimulate Glucagon Secretion. It is true that amino acids from the breakdown of dietary protein stimulates both insulin secretion and glucagon secretion. However, the “purpose” of the glucagon secretion is to stimulate liver gluconeogenesis to prevent hypoglycemia. If a normal person were to eat a steak without any carbohydrate and only insulin were secreted, hypoglycemia would result. The glucagon thus serves to prevent hypoglycemia. In a person with type 1 diabetes (T1DM), eating a steak has the same effect of stimulating glucagon and if the exogenous bolus and/or basal insulin doses are not quite enough, then hyperglycemia can result. Of course, if the insulin doses are just right, normoglycemia follows ingestion of the steak, or if too much insulin is given, hypoglycemia results. I agree restricting dietary protein to the point that muscle/protein synthesis is impaired is not a good idea. Persons with T1DM just have to tinker with the insulin doses to “cover” dietary protein. At least dietary protein requires a lot less insulin than dietary carbohydrate. In reality however, we rarely eat meals of just one macronutrient. Thus, the exogenous insulin given in those with T1DM needs to be “just right” to compensate for the protein, carbohydrate, and fat in the meal. To make matters more complicated, there are other factors besides the macronutrients that make this balancing act difficult including variable absorption of insulin from the injection or infusion site, variable absorption of the macronutrients eaten, and variable insulin sensitivity related to physical activity. Keep up the good work Marty. Your work is particularly helpful to those of us with diabetes. Very comprehensive article Marty, good stuff. I second Keith’s comment. See minute 18 on of Roger Unger’s talk on T1D/T2Ds https://youtu.be/VjQkqFSdDOc?t=18m. Not only does insulin absorption matter as Keith pointed out, so does where it’s injected and it’s concentrations across different tissues. Endogenous insulin concentrations go from about 2,000 (pancreas) to 50 (liver) to 5 uU/mL (skeletal muscle) whilst injected insulin doesn’t follow this heterogenous patterns (it’s way more homogeneous unfortunately). Also, some (at the very least small) amount of protein always turns to glucose if I recall correctly. I think the question we should be asking is How do we suppress glucagon without insulin (marginal returns as the dosage increases)? Some suggest Somatostatin (or look at it, as George Henderson has). Amazing blog post, things are really coming together with your hard work, thanks for this amazing blog post. Wonderful post!! So clear and easy to understand for such a complicated subject. Thanks heaps. There is a lot of confusion here! Thank you, Marty Kendall, for this excellent article. I have just been reading the book, ‘The Nature of Nutrition’ which puts forth the Protein Leverage Hypothesis. I was fascinated to learn that not eating a sufficient amount of protein (i.e., the amount that your body needs) will cause increased appetite and will lead to you to overeat fats and carbs (as your body seeks to get the protein it needs from other sources). So according to these authors (whom you reference in your article), adequate protein is tremendously important, and different conditions (in addition to diabetes) change the protein need (even being sedentary does this). At the same time, it’s not good to eat too much protein, because excess protein is aging and will shorten lifespan (that’s the simple version of the authors’ argument). Anyway, I’m fascinated by the Protein Leverage Hypothesis. All very interesting and very complicated! Thanks. I’m so glad people find it helpful! Great article! I have a question. If your post prandial (2h) blood sugar is relatively stable (<100) after a large protein meal (120g+), but morning blood sugar is high on waking, does that imply an issue with insulin sensitivity or not? The PP reading would seem to be most important, but I am finding elevated morning readings whilst experimenting with zero carb eating. Can you finish your question Ben? Hi, I am trying to understand if the morning FBS being higher on a intermittently Ketogenic zero carb diet ( some days very high protein ie 250g, others closer to 100) is a cause for concern or not. I still see ketones in the .3-1.0 range but often along with higher FBS (95-110)then when I was strictly VLCKD (<75). I’m confused. It sounds as if endogenous ketones aren’t healthy – it’s the produce of starving the body. As a result if you have low energy then how can that be optimal? On the other hand if you eat a lot of dietary fat (as many keto people advocate) then you don’t lose weight. Ketones are great and natural. Having high levels of glucose and ketones at the same time isn’t. would the benefits of the ketogenic diet diluted when higher protein intakes (higher than 1 to 2g*kg ideal weight) raise blood glucose ranges to the 80s-100s mg/dL range (which are often around the 60s-70s range on strictly lower protein intakes, around 0.8g*kg ideal weight)? would those BG ranges (80s-100smg/dL) be considered “a high glucose high ketone state”, provided a low carb regimen is being followed? Low blood glucose is ultimately about low energy, so higher protein could be beneficial if it leads to higher satiety and high glucose could occur from high fat which could lead to poor satiety. I would go for the higher protein intake and the normal blood sugars rather than super low blood sugars and high ketones. Unless you are managing something like epilepsy or dementia, I think the ‘benefits of a ketogenic diet is the stable blood sugars. Thank you, Marty. As a LCHP/keto follower myself, I am finding this information useful in crafting the healthiest diet for my newly-diagnosed diabetic dog. It is very helpful for both of us!